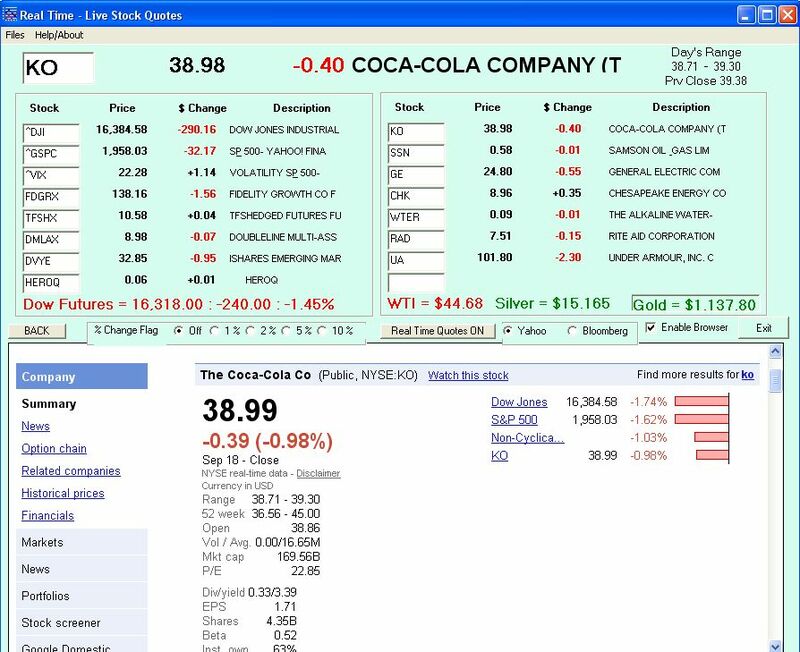 And... also updated "after hours"
This compact App is designed to give Windows Users the ability to watch up to 60 of your favorite stocks in Real Time without having to do all the "log in" or have a broker account etc etc. 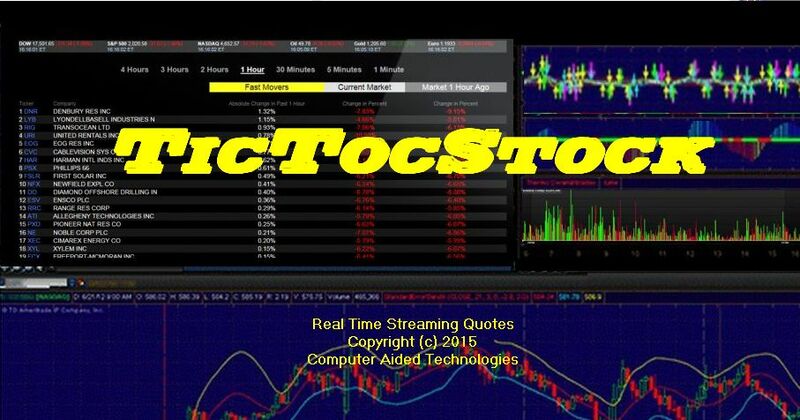 In addition you will see we show the realtime pricing for WTICrude-Silver-Gold (and) Dow Futures - Even After Hours. 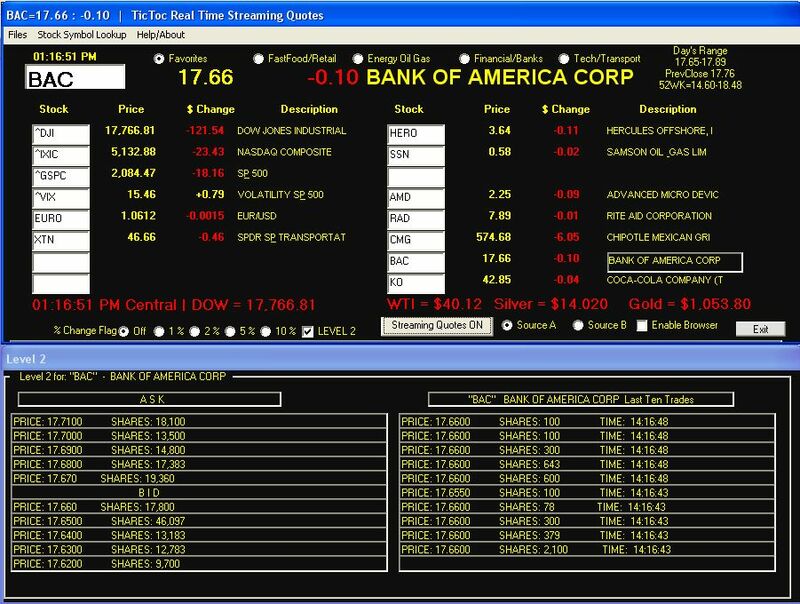 The DOW futures display alternates with the Time depending on normal stock exchange hours, based on a 5 day week using your computer's local time zone settings. We wanted to make this program as easy as possible to use. All you have to do is type in any Stock Symbol and the next "cycle" it will be shown live. No complicated forms or menus. Starts or Stops the Program's operation. You will see the Stock's border change as it is being "polled". Cycle time depends on your internet speed. Normally a cycle takes about 15 seconds. This also depends on how many stocks you are watching. The less stocks you watch, the faster the cycle time. Just type in any stock symbol. There is no heirarchical order. Places that stock into the TOP listing, which is larger and easier to see from a distance. 1 - Changes the displayed stock in the top display bar with the one you just clicked on. This remains in the top bar until you click on a different stock. Lower Browser and display it in "Google Finance's" listings. "time and resources" when you click on a Stock's Name (when open). 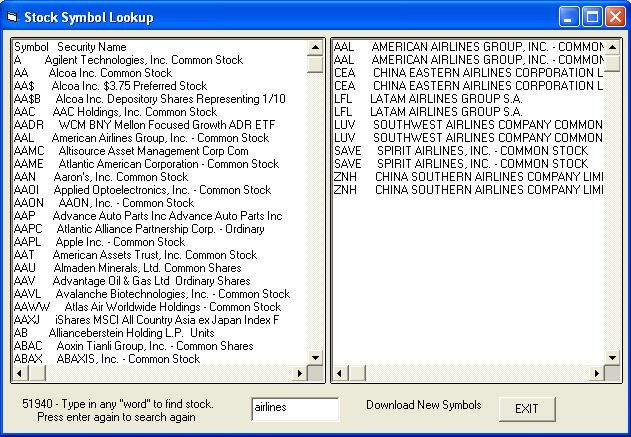 These Symbols are also supported as "stocks"
On the HELP menu, there is a selection to display a Stock Symbol / Stock Name list. * All of the results will then be displayed in a "result panel"
* Double Clicking on one of the results will place the symbol into a vacant slot on the watch list. Level 2 is updated in real time. This is an invaluable asset for "Day traders". Watch up to the last ten trades, plus both BID and ASK pricing. charge "extra" for this service.